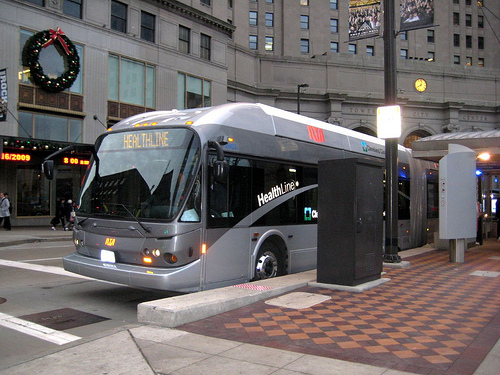 The Cleveland HealthLine is a great example of BRT in the United States, spurring billions of dollars of development along the corridor. But why don't many people know about it? Photo by Center for Neighborhood Technology. The event, organized by the Latin America Initiative, invited guests to discuss lessons learned from some of the widely regarded best practices of BRT in Latin America and their applicability in the U.S., where rapid population growth, increasing congestion and shrinking municipal and federal budgets present an urgent need to find appropriate transportation and infrastructure improvements. Panelists included Marc Elrich, councilmember for Montgomery County, Maryland; Robert Puentes, senior fellow at Brookings; Sam Zimmerman, urban transport advisor for The World Bank; and Dario Hidalgo, director of Research and Practice for EMBARQ (the producer of this blog). The discussion was facilitated by moderator Mauricio Cardenas, senior fellow and director of the Latin America Intiative at Brookings. The looming question: If BRT works so well in Latin America, how come we don’t see as many examples of it in the U.S.? The existing BRT and bus corridors comprise about 280 corridors, 4,300 kilometers, 6,700 stations and 30,000 buses, serving about 28 million passengers per day. In 2010, 16 cities completed new systems—including 14 in the developing world—and seven cities expanded their current systems. As of January 2011, about 49 new cities are building systems, 16 cities are expanding their corridors, and 31 cities are in the initial planning stages. This impressive growth may be attributed in part to the successes of Curitiba, Brazil; Bogotá, Colombia; México City, Mexico; Istanbul, Turkey; Ahmedabad, India; and Guangzhou, China. These cities show low-cost, rapid implementation and high performance BRTs, with significant positive externalities. In Latin America, alone, there are 32 cities with BRT, representing one quarter of the world’s total length of BRT corridors. These systems serve a whopping two-thirds of global BRT ridership, or 18 million people per day. Like all stories about BRT, the starting point of this morning’s discussion began with a short history of Curitiba, Brazil, commonly known for being the birthplace of BRT. The city launched its first bus corridor in 1972 and expanded it into a high-level BRT system 10 years later, with features like off-board fare collection and multiple entryways onto the buses. In Curitiba, BRT became the “backbone of a very well-thought out and developed land use and transport plan,” Hidalgo said. The success of Curitiba spread across the continent, inspiring other cities to build similar systems, like Transmilenio in Bogota, Colombia, which has the highest throughput of all cities with BRT, with 45,000 passengers per hour in each direction—a rare feat, even for rail corridors. In short, Bogota became like “Curitiba on steroids,” Hidalgo said, adapting to the conditions of an already built city with bigger transit needs. Bogota proved that it could reduce car use, while increasing biking and walking and maintaining the level of mass transit ridership. The results? A drastic reduction in traffic fatalities, lower emissions, less congestion and faster travel times. “[BRT] is mainstream now; it’s not on the edge of what you do,” Hidalgo said. He provided a dozen examples of new BRT systems in Latin America, including cities like Sao Paulo, Brazil; Leon, Mexico; Pereira, Colombia; Santiago, Chile; and Guatemala City, Guatemala. The ridership on these systems in one hour is comparable to what some mass transit systems in the U.S. see in one day. Operational speeds average at about 20 kilometers per hour (potentially, this could be even higher, like in Istanbul, where the Metrobus BRT runs 40 kilometers per hour on expressways.) Capital costs are also relatively low, making the systems attractive for cash-strapped city budgets. What we’re seeing now is that “BRT is a feature or an aspiration of most Latin American cities and should be for the U.S.,” Hidalgo said. However, BRT is not a cure-all and does not exist without some barriers, Hidalgo stressed. Often, systems face rushed implementation, especially as politicians struggle to meet election deadlines. (Luckily, the flexibility of bus-based systems allows for them to adapt and improve over time, even after they’ve started operations.) There are also obstacles with tight financial planning. User fares on BRT are low, so financial sustainability requires high occupancy rates, but that can make the passenger experience less than ideal. An advantage worth noting, however, is that the vehicles and operations of all BRT systems in Latin America, besides Santiago, are fully paid by user fares. The World Bank’s Sam Zimmerman noted several other impediments to BRT, particularly in the United States. For one, there are aggressive lobbies for rail, as well as aggressive lobbies against BRT and buses. Railway manufacturing and engineering companies also have a stake in making “big money” from rail projects, so often they discredit bus systems. But even proponents of traditional bus operations threaten support for BRT by simply making the case for better quality bus systems, which ironically gives rail lobbyists ammunition to claim that BRT is “just another bus.” Finally, there are the upwardly mobile politicians and transit officials who think the best thing for their reputation is to build a rail system or rail line extension. “How many mayors who want to be president are running on the basis of promoting a metro?” Zimmerman asked. There are also many misconceptions and “myths” working against BRT. Among them: buses are slow, unreliable, polluting, noisy, uncomfortable and low-capacity. In the case of high-level BRT systems, this simply isn’t true. Part of the problem contributing to these myths is that BRT doesn’t have consistent branding or marketing, or even a common definition, which we’ve written about before. There may also be some racial or economic discrimination against bus systems, left over from a time period when people who rode the bus couldn’t afford any other choices. Montgomery County’s Marc Elrich offered his experiences of generating support for BRT in Maryland as a concrete case study of how BRT might apply to the United States. Montgomery County, a suburb of Washington, D.C., is home to 1 million people and boasts several “mini-cities” or nodes of high-density development, especially along metro corridors. The county experiences the same dismal rates of traffic congestion as big cities like Los Angeles, New York and Chicago. In response to these trends, the county has an aggressive plan for 120 miles of transit corridors to connect residential communities to job centers. The most convincing argument Elrich found for presenting BRT to his skeptics was showing the cost-effectiveness of all the other options, including light rail, the county’s proposed Corridor Cities Transitway (CCT), busways and rapid bus. “Rail-like vehicles,” as he describes BRT, proves to be the most attractive option, and it can adequately meet the county’s transport demand. “You don’t have to love buses, but what else are you going to do?” Elrich asked.